I’ve become keenly aware this holiday season that there are some recipes that I crave just as soon as we enter the twelfth month of the year. And I’m going to warn you that most of these are hazardous for your health. Not really, but it’s not the end of the world if we ratchet up our sugar consumption just a bit for the holidays, right? Anyway, here are my five favorite recipes of the season. 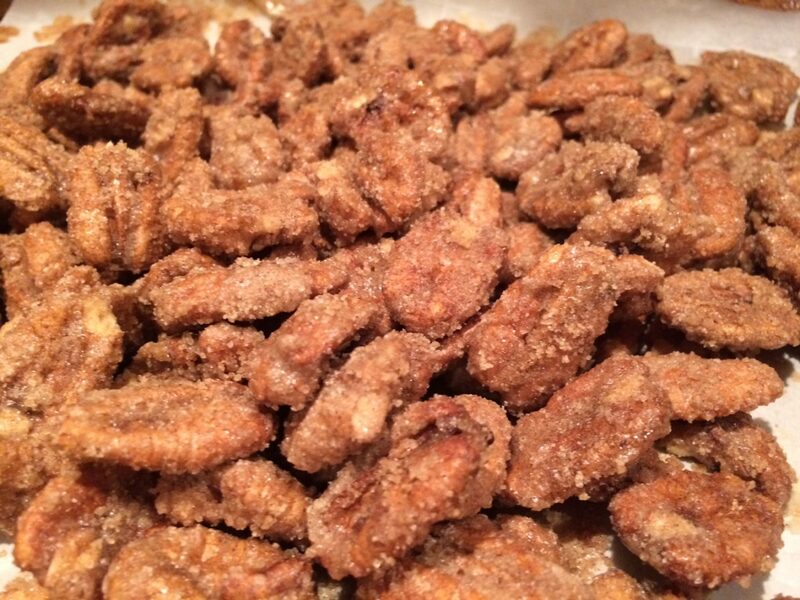 These candied pecans are a little bit of heaven. My in-laws recently moved to Texas which is apparently the land of pecan trees. They were kind enough to send us a large, flat-rate USPS box full of pecans. The kids had a blast shelling them and we’ve been enlightened to the amazing world of fresh pecans. They are fantastic. I was then reminded of the fact that people like to candy these things. I did a quick search and found this gem on Allrecipes. It’s as simple as combining pecans, an egg white, a little water, sugar, cinnamon, and salt. Baking them on 250 for an hour transforms these into something incredible. One recipe I crave year in and year out is Panettone French Toast. This is a little gem from Giada De Laurentiis that my wife found several years ago and it’s been our Christmas Day breakfast ever since. If you’re not familiar with Panettone, it’s an Italian sweet bread with little bits of fruit in it and can be found at most grocery stores during the holidays. The real magic of this recipe happens when you combine the french toast with mascarpone cheese and a drizzle of cinnamon syrup. This year, however, I got a little crazy and added some chopped candied pecans to the mix and was not disappointed. Marshmallows seem like such a simple thing– just head to the store, buy a bag, and done. But you can totally make these things– and they are really good. This Martha Stewart recipe worked like a charm for us. Combine gelatin, water, salt, sugar, corn syrup, and peppermint extract and you get delicious treats that pair nicely with hot chocolate and make incredible gifts for your friends and family. Try them and you’ll never go back to store bought. I’m a fan of roasted vegetables but nothing beats winter squash and root veggies this time of the year. I have a special concoction where I combine a couple cups of both cubed butternut squash and yams, a diced green apple, a half cup of chopped pecans, and a half cup of dried cranberries. Stir all of these together with a drizzle of both olive oil and agave syrup or honey. Finally, sprinkle with salt, pepper, and cinnamon and roast in the oven on 425 for 25-30 minutes, stirring at least once halfway through. The result is a wonderful, sweet, side dish that goes great with a Christmas ham or turkey. Before you go thinking, I’m going to get all healthy for the holidays, my favorite holiday recipe of all is homemade caramel corn. Here’s a recipe we’ve been making in my family for many, many years. This one starts by popping a whole bunch of popcorn. For a fun treat for the family, I pop ½ cup of kernels and have found that it’s simple to do on the stove by cooking the kernels in a covered stock pot. Be sure the shake the pot to mix the kernels every 10-15 seconds to prevent burning. To make the caramel, bring one stick of butter, ⅔ cup of light brown sugar, ¼ cup of light corn syrup, ¼ teaspoon of vanilla, and ¼ teaspoon of salt to a boil and stir constantly for five minutes. Once the caramel is ready, combine with the popcorn and mix them together in a turkey roaster. The real magic of this recipe happens when you bake on 250 for 45 minutes, stirring every 10 minutes. The result is a nice, even distribution of caramel. Amazing. So those are my five favorite holiday recipes– and you can rest assured that our first post of January will have something to do with eating better. Until then, enjoy. 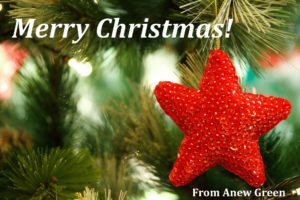 From your friends at Anew Green, we hope you have a wonderful holiday season and a very Happy New Year.